We don't have any trips to Greece at the moment . Most popular festivals in Greece have religious origins, in this case, in Orthodox Christianity. This branch of Christianity punctuates the calendar with important Greek festivals. On each month of the year, Greeks have a specific popular festival for celebrating a stipulated event. Take note of the following events in Greece before planning your journey. On the first day of January, Greeks celebrate the Feast of Saint Basil, on which gifts are exchanged and the New Year Cake (which is like the Spanish Roscon de Reyes, a festive cake eaten on 6 January) is eaten, containing small coins hidden within it. On the sixth of January on the other hand, the Blessing of the Waters is celebrated within the popular festivals of Greece. This celebration consists of launching a cross into the sea which is recovered by voluntary swimmers. Whoever manages to bring it back to shore will have good luck throughout the year. On the eighth of January is one of the most feminine Greek festivals: Women’s Day. During this day, Greek women gather in the bar to celebrate their day, while the men and boys take charge of the home. In February, carnivals are the stars of popular Greek festivals. In Greek the event is known as Apokrias, and this celebration lasts for two weeks. Different events take place throughout the country, with activities and festivals reminiscent of the New Orleans Mardi Gras. Among the most unusual Greek festivals is the Katheri Deftera which is celebrated forty days before Easter. The custom is to fly paper kites, so if you are in Greece during these times, don’t miss out on this event. In turn, on the 25 March Independence Day is celebrated in Greece. As in every country that celebrates this event, there are military parades and various official activities. Keep in mind that, during this celebration the Acropolis and all museums and archaeological sites will be closed. Durante April, Greeks celebrate Holy Week, and particularly devoutly on Good Friday, especially in the more traditional towns and villages. During the Saturday, the custom is to ring the bells of all the churches. The largest celebration, on the other hand, takes place on Easter Sunday, during which it is traditional to roast a lamb and crack red-dyed eggs together. 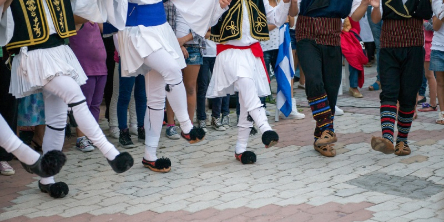 If you are in the country during May, you can attend one of the most traditional Greek events: the folklore festival at Eleusis. At the same time, the island of Lesbos celebrates a Week of Prose and Art. And in Trikala, the celebration of the Hadjipetria Festival also takes place with various sports competitions, a conference and dances. During June, the greatest number of events are held in Greece: in Lesbos the Bull Festival is celebrated, in Hydra they celebrate the Miaoulis Festival, and in the rest of the country the Agios Pnevmatos Festival. The latter lasts for a whole weekend and is one of the most well-attended and lively Greek festivals. If you are travelling in July, another Greek festival that you should not miss is the Wine Festival of Rethymnon. In Janena, you can attend the Eprirus Festival, which is a cultural celebration of popular art, theatre, dance and concerts. Also in July (right through to September) the Heraklion Festival is celebrated in which the best Greek musicians take part. During the month of August, specifically the 15th, Greeks celebrate Panagia Day, or the day of the Virgin Mary. This is a day of popular festivals of great religious fervour which takes place throughout the country. In each town and village, the faithful make pilgrimages to the church on their knees in order to pay homage to the Virgin. During the month of September, the Anhiolos (Salónica) Festival of Wine takes place. Also during this month in this region, the international Film and Song Festival is celebrated. Both events attract many people, so it is worth reserving beforehand if you plan to travel to Salónica during these dates. On 28 October, the Eighth Day is celebrated. This festival is one of the most commemorative festivals of the Greek spirit. Homage is paid to the Greek resistance to the Italian occupation during the Second World War. November is the month in which one of the most radical festivals in the country takes place. On 17 November each year is the anniversary of the student revolt at the Athens Polytechnic University which took place in 1973. Many students died during the demonstrations against the dictatorship and repression by the government. Apart from Christmas, in Kozani Greeks also celebrate the annunciation of the birth of Christ by the shepherds. This celebration is called Kladaries in Greek and consists of a ceremony in which locals light fires and dance around them. During the festivals, there are prizes for the best fire and much Greek wine is shared. As you can see, the popular festivals of Greece are many and varied. Whether from religious or pagan origins, they deserve a space in your travel diary for you to discover them. If Greece has caught your attention, leave us your number so we can call you to discuss the voyage that awaits you.